℗ 2011, 2010, 2012 Brilliance Audio, Inc. 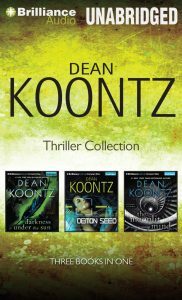 This collection is/was marketed as “Dean Koontz Thriller Novella Collection” but the front cover states “Dean Koontz Thriller Collection”. Marketing materials for this title pictured a box having a rectangular shape, like a premium paperback, but was released in a square box as pictured here.